After having done it a couple of times before, I'm officially declaring Staccato - a number of short notes from around the sports and marching/athletic music realms - an 80 Minutes of Regulation series. I've actually been out of town for the better part of a week, vacationing in Kentucky (including a couple of days spent in the home of the toothed birds). 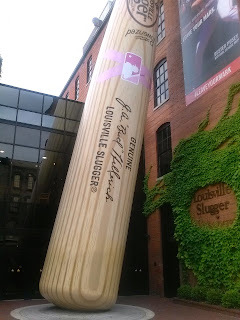 I did a few sports-related things (Muhammad Ali Center, Louisville Slugger Museum and Factory, Churchill Downs and Kentucky Derby Museum) and sports-adjacent (does bourbon count as a sports-adjacent?) things while I was there, but I share this mostly to point out that due to my absence, some of the topics may not be the freshest, as I made note of them before I left. -The NCAA Men's Basketball Tournament, which has been spread between CBS and Turner networks, has announced that the semifinal games will be on TBS, making the championship game the sole Final Four matchup on network television. -Following a brief stint paired with the Southwestern Regional in San Antonio, DCI's Individual and Ensemble competition will return to championship weekend in Indianapolis. -Chances are pretty good that the highest paid public employee in your state is a football or basketball coach. -There's discussion once again on whether or not the Washington Redskins will ever change their racist name. The word from owner Dan Snyder? Never - You can use caps. -In news that surprises no one after the crumbling of the Big East, the ACC has its sights set on Madison Square Garden for the men's hoops tournament. -Memorial Day weekend action is set: Denver, Duke, Cornell, and Syracuse advance to the men's Division I lacrosse Final Four. -The Bobcats have begun the process to bring the Hornets name back to Charlotte. -And last but certainly not least: Since we ditched cable a month and a half ago, one of the things I've been missing is regular sports coverage, a la SportsCenter. With YouTube as my primary go-to, I've been curating sports (and, because it's me, marching/athletic music, though that's thin at this time of year) news every few days into "shows" I can watch with stuff that interests me. A great side effect is that I'm getting content from not just ESPN, but also Fox, CBS, SBNation, and a host of other sources. With that in mind, would anyone be interested in me sharing the shows I put together? I'm glad to; it you want them, just say the word!